Whether it’s for philosophical, spiritual or holistic reasons, Asia has the highest number of vegetarians in the world. 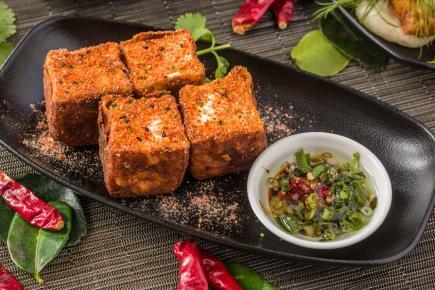 Asia’s street food cuisines offer diners a myriad of fascinating flavours and textures to explore, and many of Asia’s most iconic dishes are vegetarian. 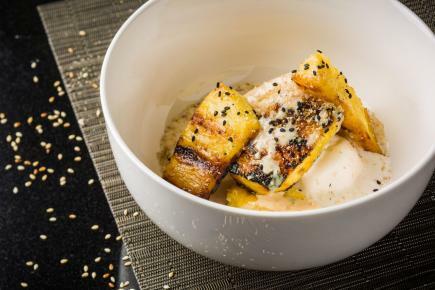 The new vegetarian menu at Soho Spice captures the dynamic regional cuisine of award-winning chef Peter Cuong Franklin, with vibrant, flavourful dishes laced with the freshest locally-sourced ingredients to create one of the city’s finest vegetarian dining options. Tucked away in busy Elgin Street, in the heart of Soho, the new-look Soho Spice is designed for diners with a passion for contemporary Southeast Asian street cuisine, and draws inspirations from the hawker stalls of Thailand, Vietnam, Malaysia, and beyond. 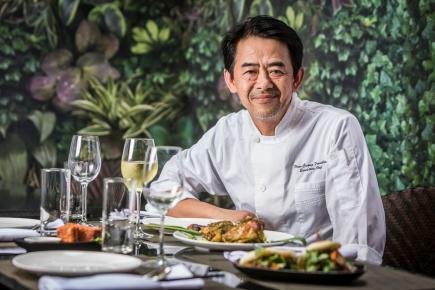 Amidst sophisticated new interiors, Chef Franklin has incorporated his traditional French technique with market fresh ingredients to create the city’s leading vegetarian menu. Highlights of the new vegetarian menu include crispy portobello bao slider served with pickled daikon, fresh coriander and mint; silken tofu with crispy garlic and house-made nuoc cham sauce; and grilled sambal aubergine lasagna with turmeric rice. 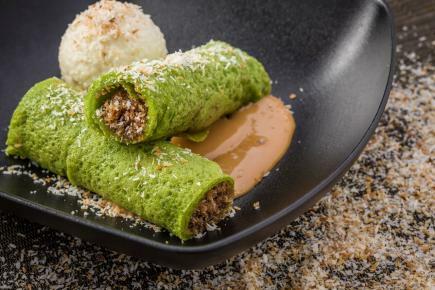 Soho Spice’s new vegetarian menu features delicious desserts, including the pandan coconut pancakes with caramelised coconut flakes and house made coconut ice-cream; and the addictive grilled pineapple with coconut ice cream, rum vanilla sauce, salted peanuts and sesame. Soho Spice also offers convenient and competitive set lunches offering a choice of two courses from the a la carte or vegetarian menu. Priced from HK$98 per person, lunch favourites from the vegetarian menu include green papaya salad, sweet corn fritters and gado gado. The restaurant is situated just steps from the Mid-Levels Escalator at 47B Elgin Street, Central, in the heart of Hong Kong’s popular dining precinct, and has a capacity of 65 guests. Open for lunch 12.00 noon to 3.00 PM and dinner from 6.00 PM to 11.00 PM. For reservation, please call (852) 2526 2227.